A number of new details on Infinity War have surfaced through various set visit reports, with directors Anthony and Joe Russo revealing the movie that is the most "connected" to this sprawling superhero adventure. The directors revealed that the movie which is the most "narratively connected" is Ant-Man and the Wasp, which will be the next MCU movie to follow Avengers: Infinity War on July 6. Here's what Joe Russo had to say, revealing that Ant-Man and the Wasp is the most connected to Avengers: Infinity War. "They all lead in in their own way, I think. As far as plot elements that actually drive towards the story, again, I think Marvel does a great job of segmenting the movies so that you can have your own experience in each film. I think from a plot standpoint, if there's any corollary, Ant-Man and the Wasp probably has some elements that stitch in." While that statement may not be terribly surprising, since Ant-Man and the Wasp arrives just two months after Avengers: Infinity War, it is rather intriguing, since the first Ant-Man was among the most self-contained films within the MCU. That all changed in Captain America: Civil War, when Captain America (Chris Evans), The Falcon (Anthony Mackie) and Hawkeye (Jeremy Renner) recruited Scott Lang/Ant-Man (Paul Rudd) to join Team Cap. We haven't seen much of Ant-Man in the Avengers: Infinity War marketing, but since Ant-Man and the Wasp is one of two movies, along with Captain Marvel (March 8, 2019) to debut between Avengers: Infinity War and Avengers 4 (May 3, 2019), it's easy to see why Ant-Man and the Wasp may provide a bridge, of sorts, between both movies. Ant-Man and the Wasp star Evangeline Lilly (Hope Van Dyne/The Wasp) has discussed the expansion of the Quantum Realm, the mysterious place that was introduced in the first Ant-Man, which will help introduce the "multi-verse" concept to the Marvel Cinematic Universe. The Quantum Realm will also be featured in Captain Marvel, which could also help bridge the gap between Avengers: Infinity War and Avengers 4, and the Quantum Realm could very well play into the ending of Avengers: Infinity War, leading into Ant-Man and the Wasp and then to Captain Marvel. As for Avengers: Infinity War's connections to Ant-Man and the Wasp, Anthony Russo wouldn't elaborate any further, only stating that, "we can't talk about that." Thankfully, fans won't have to wait long to see how Avengers: Infinity War connects to Ant-Man and the Wasp, although, with all three MCU movies for 2018 bunched into a five-month period between February and July, the wait between Ant-Man and the Wasp and Captain Marvel, which is currently in production, may be rather excruciating for fans. Captain Marvel (Brie Larson) herself will also have a presence in Avengers 4, which was hinted at with photos of the actress on the Avengers 4 set and later confirmed, although she will not be featured in Avengers: Infinity War. 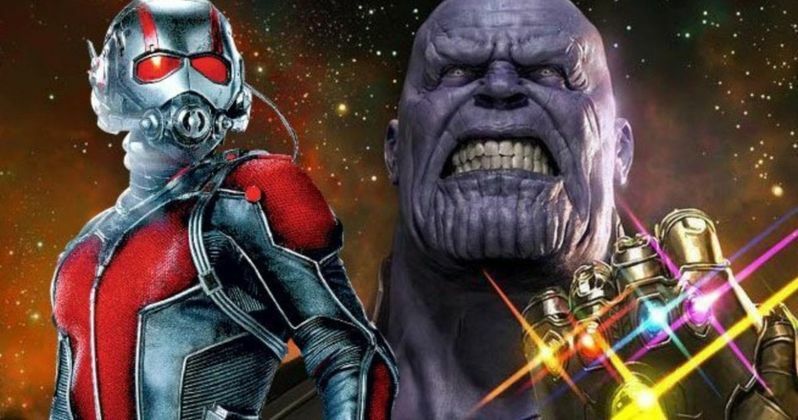 Screen Rant broke the news on the connection between Avengers: Infinity War and Ant-Man and the Wasp earlier today.